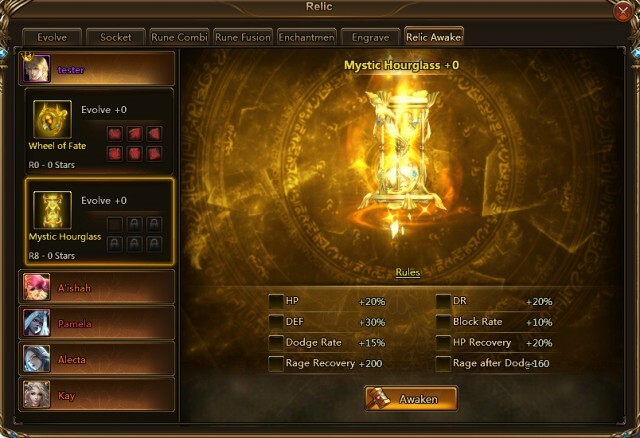 New Customizable Relics Hits League of Angels II! Mythic Relics have been the top dog of Relics on Sapphire for over half a year, but now that is about to change! A more powerful Relic, called Artifact Relics, will be released this week! There are 2 Artifact Relics, one is an ATK Relic called Wheel of Fate and the other is a DEF Relic called Mystic Hourglass. Being the next step above Mystic, the attributes of Artifact Relics will be much higher! For base attributes, the Wheel of Fate provides ATK+1000 bonus. In comparison, the Mythic Relic Wyrm Heart provides only around 400. Likewise Mystic Hourglass can increase a Hero’s HP by 3840, which is twice of what Divine Shield provides. In terms of customization, Artifact Relics have 4 attributes that can be selected by players! When players equip an Artifact Relic, they can click on “Relic Awaken” tab in Relic panel and choose 4 of the 8 given stats for their Relic. The value of the 8 stats are also higher than their Mythic counterparts. With Artifact Relics, players can now customize their Relics based on the different needs of of their Heros’ skills. Along with strategic socketing of Runes, Artifact Relics can surely maximize your Heroes’ potential or cover their weaknesses! Additionally, Artifact Relics have higher max potential than Mythic Relics. They can be engraved to R8, surpassing Mythic Relics by 2 ranks. 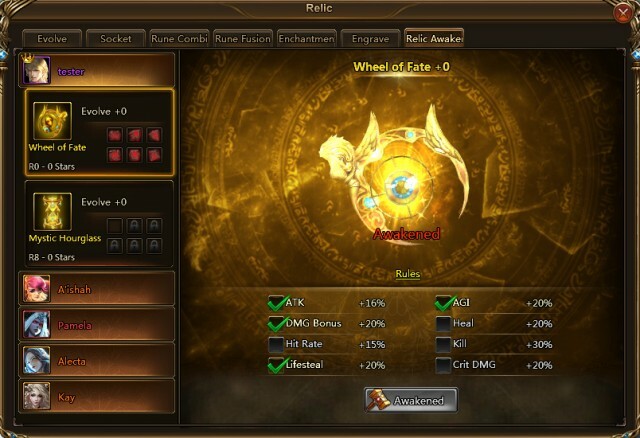 The pair of brand new golden-colored Relics is now available in the Wheel of Fortune event! The 2016 Year End Carnival will be over soon, so grab this last chance to complete your wishlist in 2016!